Truly super, Joe. I'd read a book featuring this costume. Love the colouring and linework but why would he wear gloves? I mean yeah, he wears boots because he lives in a society wear going shoeless is frown upon but the gloves, really? Batman wears gloves because he's a detective who doesn't want to leave fingerprints, Green Lantern wears gloves because it's part of his police uniform but Superman? His hands don't need protection and especially not protection with such a "dramatic flair". Superman believes he's an Everyman or at least he tries to convince himself that he is. Gloves would never be an option. Also, why do people keep giving him that Brylcreem oil-slick twirl? He wore his hair like that in his first appearance because that's how men styled their hair in the 1930s. Now it just looks stupid. Thanks a lot, dude! I really enjoyed your design as well. As for the "oil-slick twirl," true it's an aged and classic look, but that's what Superman is. He's old school. The first superhero. So I wanted to maintain at least some elements of his classic look. And really, I don't think I diverged all that drastically from the original costume. I just tried to streamline it a bit more. Also, the curl is so characteristically Superman, that I thought I couldn't edit it out. And with that, I've typed out one of my longest comment responses. Time for some breakfast. Yeah okay, Joe. I'll give it to you; that makes sense...the glove thing, I mean. But that curl just has to go, it reminds me to much of John Travolta in Grease (yes, I've watched Grease). On a side note, what do you use to make those great lines (and while I'm at it, do you use Photoshop to colour)? Your She-Ra looks amazing. Sorry, I didn't realise you don't fraternize with your "audience". Next time I'll remember to keep my stupid questions to myself. Apologies for not immediately responding to your comment. I've been very busy recently, and don't spend all my time scanning the comment sections of my blog posts. My silence was not meant as a burn towards you - whoever you are. To answer your question, yes, I use photoshop to color. 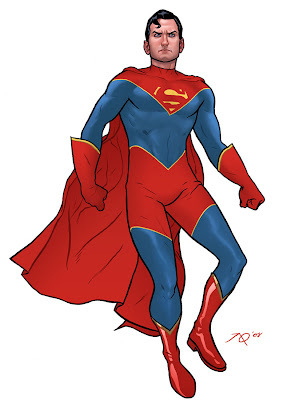 I dig the Supes outfit! It's different but it still clings to the red and blue of old, very cool. They should adopt it in the new Supes movie, whenever they decide to dig Bryan Singer out of the hole he created. Man I really love your style and your design sense. Your blog's blowing my brains out.